Morant, Lufrano and Handlin break school records, Evans and Quainoo and 4×200 win at Jim Mitchell Invit. 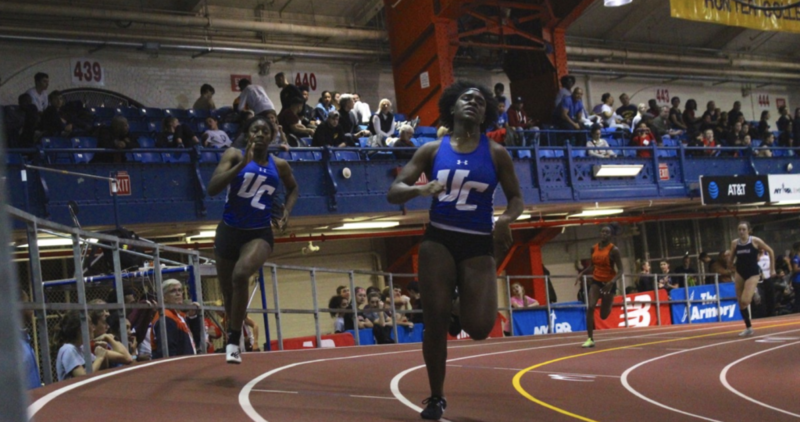 Leena Morant, who won the 600-meter run, Jerika Lufrano and Hope Handlin all took down school records, and Khamil Evans, Felicia Quainoo and the 4×200-meter relay all scored victories for the Union Catholic girls at the Jim Mitchell Invitational on Friday night at the 168th Street N.Y. Armory. Morant, a junior, won the 600 in 1:34.07, the second fastest time by a N.J. runner this season, to break the UC school record of 1:34.66 set in 2016 by Amari Onque-Shabazz. Handlin, a senior, cleared a personal best and NJ #5 10-6 to place second in the pole vault as she shattered the school record of 9-6 that she shared with Mia Bennett-Jones. Jones made 9-6 last year, and Handlin matched the record when she made 9-6 at the Essex County Coaches Season Opener on Dec. 14. Lufrano, a senior, took over the state lead this season when she finished second in the 1,000 in 2:57.67, which broke the school record of 3:02.17 that Lufrano ran last year. Evans, Quainoo, and the UC 4×200 relay team also sparkled. Evans, a senior, won the 300 in a personal best 40.23, the fastest time in N.J. this season, and Quainoo crossed the line first in the 55 hurdles in 8.46, the third fastest time in the state this winter. UC lit up the track in the 4×200 as Sydney Tucker, A’Liyah Thomas, Quainoo and Evans blasted a 1:43.54, the No. 1 time in N.J. and No. 7 time in the nation so far this season. In other highlights, Tucker was third in the 300 in 40.73, Zamira Ysaac placed third in the 600 in 1:38.18, Ashleigh Patterson finished fourth in the 600 in 1:38.24, and Avery Jordan was sixth in the hurdles in 8.81 and ninth in the 300, and Morgan Williams was seventh in the 600.